It has been hypothesized that coverage of diabetes-specific issues (e.g. coping with complications, incapacity, pain) during psychotherapy may optimize the likelihood of treatment success for depression in patients with diabetes. However, it is still unclear how often depression is confounded by diabetes-specific emotional problems. We aim to determine the levels of diabetes-specific emotional problems in diabetic individuals with high versus low levels of depression in a sample of 539 outpatients with diabetes (202 Dutch, 185 Croatian and 152 English). Subjects completed the Center for Epidemiological Studies Depression and the Problem Areas in Diabetes scales. Percentages of patients with high depression scores were: 39 and 34% (Croatian men and women), 19 and 21% (Dutch men and women), 19 and 39% (English men and women). 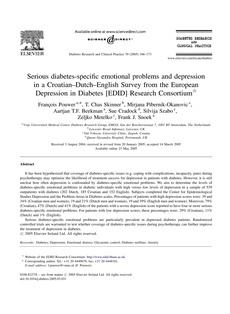 Moreover, 79% (Croatian), 47% (Dutch) and 41% (English) of the patients with a severe depression score reported to have four or more serious diabetes-specific emotional problems. For patients with low depression scores, these percentages were: 29% (Croatian), 11% (Dutch) and 1% (English). Serious diabetes-specific emotional problems are particularly prevalent in depressed diabetes patients. Randomized controlled trials are warranted to test whether coverage of diabetes-specific issues during psychotherapy can further improve the treatment of depression in diabetes.